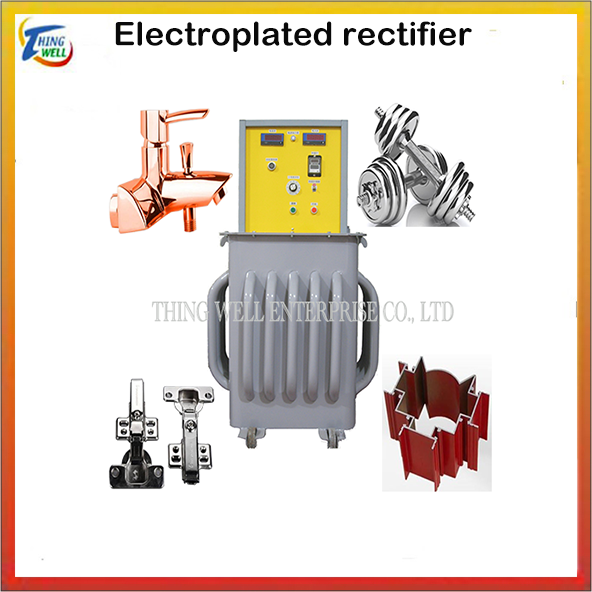 Plating rectifier,Electroplating rectifier,-Electroplating machinery and experimental machine related categories-Thingwell Enterprise Co., Ltd. Application: Various plating, Aluminum anodizing, Electrophoretic paint, PCB plating, Hard chromium plating, Surface treatment, Metallurgical refining,etc. 1)Wave types are available for direct current method, pulse method, PR method, alternative current method, alternative & direct current method, recovery method, inversion method. 4)SCR rectifier：Advantage：Low trouble chance, durable long life, with more higher material cost, Electronics components application is less than high frequency type, it is not easy to corrode by humidity, acid, alkaline air. (defect: with more higher price, with more bigger space occupied, with more heavy weight, with more higher power consumption when it is compared with same power of high frequency type). 5)Cooling method of high frequency rectifier is available for 2 types: air cooled type, water circulation cooled type. 6)Cooling method of SCR rectifier is available for 5 types: air cooled type, fan cooled type, water circulation cooled type, oil dipping cooled type, oil dipping + water circulation cooled type. 7)Air cooled type, fan cooled type, water circulation cooled type is easy to corrode, aged by acid, alkaline air, due to contacted mechanical components directly, it is not suitable for application when factory site is under higher acid, alkaline air status. 8)oil dipping cooled type and oil dipping + water circulation cooled type is to immerse most of rectifier unit into oil, mechanical components is not easy to get trouble, due to it is not contact acid, alkaline air easily. It is suitable for application of electroplating factory when it is under higher acid, alkaline air status. 9)High-frequency rectifier：High efficiency, very low power consumption, small size, light weight, cheaper, gradually become the mainstream in China. (Mainly in recent years, environmental China management is changing rapidly, do not want to buy durable). 6)SCR Oil-immersed rectifier (0---80V)（0---3,000A) Aluminum hard oxidation special. ◎ Above plating rectifier buyerscan specify DC / V and A specifications as needed. AC: 220 / 380 / 415 / 440 / V ±10V / three phases /50 / 60HZ. ◆Platingrectifiers are divided into: single-phase half-wave, single-phase middle out,single-phase bridge, three-phase half-wave,three-phase bridge, double star six-phase, andother rectification methods, feasible automatic constant voltage, automaticconstant voltage setting Current, automatic current density, etc. ★Plating rectifier series,the current waveform varies due to rectification, DC waveform differenceseffect the plating luster, current level of uniformity. 1) High-frequency water-cooled/Air-cooled rectifier into A / B / C / D grades, using different materials to make it, quality and price are difference, the warranty period is different (Inquiry product details please specify V and A specification as well as other relative requirements). 2)SCR Oil-immersed rectifier into A / B grades, using different materials to make it, quality and price are difference, the warranty period is different (Inquiry product details please specify V and A specification as well as other relative requirements). 3)Taiwan production of SCR Oil-immersed rectifier, in normal use the average life of more than 15 years.